All over the world, tens of millions of people use sidewalks without even giving them a second thought. But artist Alex Losett invites us to reconsider these mundane objects as chronicles of humanity in Parallax, an upcoming two person show at the Gray Gallery in Philadelphia. Losett’s Panels reveal that manhole covers—like honorary plaques or official seals—commemorate the aesthetics of industry. The image of leaves on a water company’s manhole cover is titled “Leaves on Water”. The panel featuring an electric company’s manhole cover is “Power”. A made-in-India manhole cover for a Manhattan sewer is called “Globalization.” Thus her Panels are laden with multiple simultaneous meanings while sharing a conceptual dimension. These conceptual art objects are positioned at the intersection of painting, collage, and sculpture. They deal with minimal narrative, contain few visual elements, feature little to no imaginary space and provide only the barest hints of spatial perspective—there is no up or down, no right or left. The Panels are, however, highly textural. They derive their impact from the complex process of painted “construction”, using multiple layers of paint application over specially prepared substrates. All of the images are displayed with their edges exposed and with the contours understood as integral to the image itself. The physical properties of the materials caused some panels to curve slightly inward during the process of creation; Losett embraced and built on this unpredictable aesthetic. 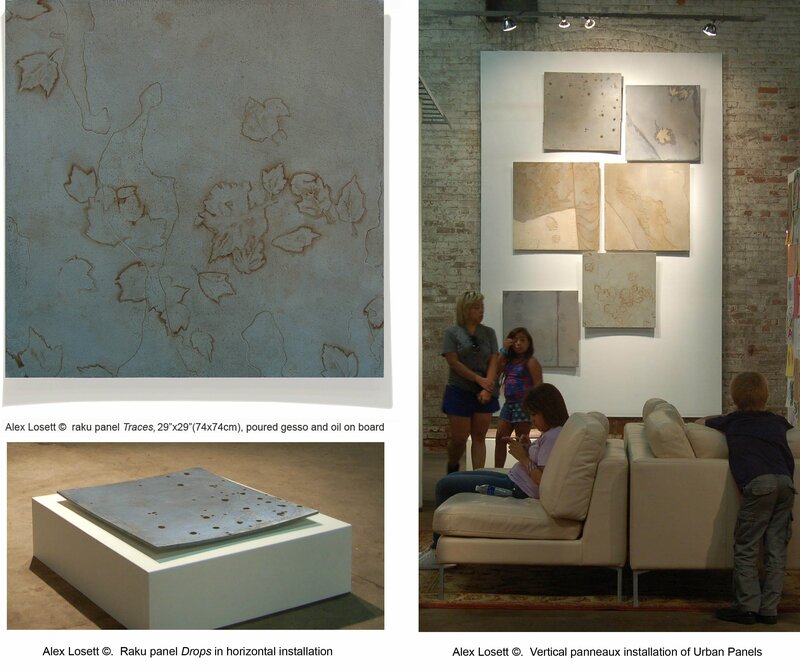 The Urban Panels will be shown in Philadelphia for the first time in a two person exhibition of Alex Losett and Gary Reed, entitled Parallax, at the Gray Gallery. The two-person exhibition "Parallax " highlights the grit and beauty to be found in, around and on the streets of Philadelphia. The work in this exhibition capture the essence of the urban environment under our feet, in front of our eyes and in the sky. From the crumbling architecture and rusted manhole covers, this exhibition challenges the viewer to reassess the paths they take through the city on a daily basis. The exhibition will be open from October 26 through November 22, 2014 at the Gray Gallery, 222 West Harvey Street Philadelphia, PA 19144. The opening reception is set for Sunday, October 26th from 4 to 6 pm.